THE READERS RAG: HUGH HOWEY'S "WOOL" KNITS TOGETHER A FABULOUS PLOT THAT KEEPS YOU TURNING THE PAGES FOR MORE! 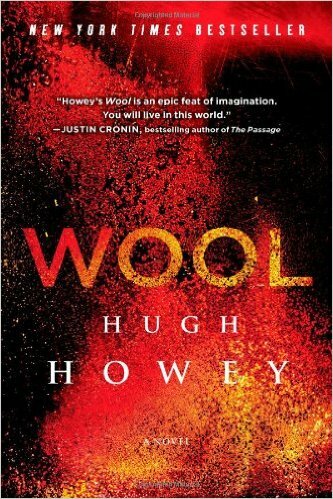 HUGH HOWEY'S "WOOL" KNITS TOGETHER A FABULOUS PLOT THAT KEEPS YOU TURNING THE PAGES FOR MORE! I have a friend who is pushing 50. She is a really great writer in my opinion, but hasn't yet broken in on the big time that I believe eventually awaits her. Recently, she had an outpouring of inspiration that finished up with a series of books she posted online for sale at the super modest price of $.99. Luckily, these books weren't too long, because I'd really object if she wrote something like 500 pages and only earned $.99 for writing them. So what was on her mind? The answer is she'd been watching some youtube videos about making a killing in the self published book industry and she'd been following their advice. I don't know. It seems crazy to me. However, perhaps I shouldn't be so glib. Apparently, a well known author, Hugh Howey, author of "Wool" did exactly that. In July 2011, he wrote a short story, put it online for $.99 and ended up making thousands and thousands of dollars and has never had to work again, or "work" in the traditional sense. I'm sure cutting book deals and selling movie rights is work, and I'm sure he's had to continue writing more books and followups to his initial ebook which is work, but you know what I mean. Within a month, that book of his had sold 1000 copies and within a year, he was making $150,000 per month in book sales alone. What a story! It is the story of dreams, enough to create many millions more of copycats like my friend who are unlikely to achieve the like, but will certainly aspire to doing so. In a way, Hugh Howey wrote a book which became a bestseller, but he also lived a story that is worth reading in and of itself! So who is this Hugh Howey who has made the intrepid climb to the top of the self publishing heap? Hugh Howey was born in Charlotte, North Carolina in 1975 and is around 41 years old. He then grew up in Monroe, North Carolina. He worked as a roofer, an audio technician, and also as a yacht captain to the rich and famous for eight years before he turned to the literary life. Mr. Howey lived in Florida with his wife, Amber, until 2015 when he moved to South Africa and purchased a 50 foot catamaran called "The Wayfinder" in which he intends to live and travel around the the world for the next ten years. He and his wife have no children by choice, but they do have a dog named Bella apparently. I hope the dog doesn't get seasick. My general impression of Hugh Howey is that he is a direct, straightforward guy who doesn't pull a lot of punches and according to him, he is not all about the money. This may actually be true because he turned down a lot of offers from publishing companies before he was willing to sign onto a contract because he wanted one that would continue to allow him to self publish as he wished. He also has a bit of a sense of humor which I will leave you to discover in the video I have posted about what he does during a typical writing day. I can't say I am a particular expert on Hugh Howey. The only book I've read so far is "Wool", although I can assure you that this first book was sufficiently absorbing that I am already sitting here with the second book entitled "Shift." I'll get started reading that book tomorrow. "Wool" is about a dystopic future where what remains of the human population is holed up in a multilevel silo which no one can leave because the environment outside is so toxic. The top level of the silo contains the white collar workers, the mayor, and the sherif who have access to a screen which shows them the ruined landscape outside their refuge, including a destroyed city at a distance. Anyone who commits a capital crime, or the even worse crime of saying he or she doesn't want to live in the Silo any longer and instead wants to go outside is condemned to what is called "cleaning" which amounts to going outside in a kind of spacesuit looking garb to go scrub the exterior lenses that provide the images on the screen. Unfortunately, anyone who goes outside will die because the environment is so toxic. The story begins when the Sherif who acts as the top law enforcement officer of the Silo voluntarily decides to go outside and do a cleaning. This leaves the reader with all sorts of questions. What makes the sheriff volunteer to go outside to a certain death? What made his wife do the same thing three years before? What secrets does the Silo hide that will no longer remain a secret? Can the people of the Silo survive once the truth is revealed? We will find this out as the story progresses through each thrilling and tension filled chapter! One of the more interesting aspects of "Wool" that some writers have spoken about is the unique relationship between Hugh Howey and his audience because of the modern internet. Since Mr. Howey started with a short story rather than a full and complete novel, his work developed along with the establishment of his audience. So as he was writing the story, his readers commented upon his plot and characters in such a way that Mr. Howey has acknowledged certainly had an impact on the final product. Some people have suggested that this is a unique feature of the modern age. However, this approach isn't actually that new. Authors have written in serialized formats before. For example, Charles Dickens who received constant feedback from his audience about what they thought about the direction his tales ended up taking. When it comes to writing, there really is nothing much that is new in terms of format, approach, or structure. Most of what we read is derivative in one way or another--in fact I heard echoes of Ray Bradbury in much of Hugh Howey's writing. But what is new is the mind and heart of a new writer that can take these old ideas and recreate them so they come across as new again. For that, Hugh Howey definitely deserves credit. Hugh Howey is represented by literary agent Kristin Nelson who was able to negotiate a deal for him where the publishing company of Simon & Shuster took over the print side of publishing his work while he remained in control of his ebook empire. She also worked with him on getting the book optioned for the film rights with Ridley Scott. Kristen Nelson appears to be a down to earth midwesterner with the kind of omnivorous appetite for books that this book blog was intended to celebrate. According to her bio, she has "represented over thirty five New York Times bestseller titles and many USA Today bestsellers." Out of her many clients, I particularly admire her for working with Gail Carrigher -- may I kiss her extraordinarily fascinating literary feet -- and also Simone Elkeles -- totally hot hot teen literature! All the rest, I don't recognize which isn't a good sign since I frequent my local bookstore on a daily basis. But all you need are a few truly great authors to keep your business afloat, I assume. It just goes to show that picking winners isn't as easy as all that. And clearly, Hugh Howey, is one of her winners!